April 2014 marks the 20th anniversary of the Rwanda genocide, when 800,000 Rwandans were killed in 90 days. Of the four countries Bpeace works in today, Rwanda has the smallest Bpeace presence. But that wasn't always the case. In our early years, Rwanda was Bpeace's obsession, and over the past 12 years we have delivered some innovative services to female business owners in Kigali and Butare. Today our activities in Rwanda involve key partnerships, not only because partnerships allow us to accomplish more than we could on our own, but because funding for Rwanda is hard to come by. Ann Mincey, one of Bpeace's five co-founders, with the iconic Rwanda Peace Basket (named by us). Back at Bpeace's founding in 2002, Rwanda was just seven years past its genocide. The then head of UNIFEM (now UN Women) pointed us to genocide widows and suggested that we try and make a market for the artistic baskets they were weaving. 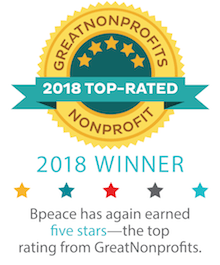 We took on the challenge, and Bpeace efforts were featured in Marie Claire, on CNN and NPR, and placed more than $100,000 into the hands of the Rwandan basket weavers, composed of previously warring Hutu and Tutsi. Although we haven't been involved for 10 years, the Rwanda baskets that Macy's sells are a direct result of Bpeace's early activities when a handful of us saw the potential of a role for business in peacebuilding. Fast-forward to 2006 when Anne Kellett led the team that recruited our first group of Rwandan Fast Runners--all women. Among them was Soline, a commercial landscaper. Our first Traveling Mentor was Tatyana Kovalevsky, an American horticulturalist, who took four weeks' vacation and worked with Soline helping her solve propagation, irrigation and pest control problems. Among Soline's clients was President Kagame. In 2011, Bpeace helped Soline apprentice with landscapers in the U.S.
Rwanda needed experienced hairstylists. Everyone, it seems, wanted their hair styled on a regular basis, and not just for weddings as they do in Afghanistan. To meet the need, salon owners were importing hairstylists from Uganda. Regis trainers and Kate at one of Rwanda's many genocide memorials back in 2007. In 2007, Bpeace co-chair Kate Buggeln invited Regis Corporation, one of the U.S.'s largest operators of beauty salons and retail stores, to send two of their experts to train 35 employees of three of our Fast Runners. Award-winning photographer and filmmaker Peter Lien was there to record the events. We were so enthusiastic with the outcome that we and the Fast Runners saw the potential of creating a beauty school in Rwanda. Before we could achieve lift-off, the 2008 market crash hit, and without external financial support, the Rwandans were unwilling to proceed on their own with creating a school. Barbara Bylenga, who worked so diligently on the beauty school, later shifted her efforts. Today she remains a valued Bpeacer and runs her own nonprofit --Open A Door Foundation -- which helps Rwandan girls gain scholarships to U.S. colleges. In Rwanda's cash economy, as we worked with Fast Runners, we realized they did not have context to intuitively understand tracking their business finances. Our then Bpeace Board Director, Sabra Richardson, came to the rescue, making many trips to Rwanda to conduct finance training, pore over our Fast Runners' books and "find the money." Steve awakening some of our Fast Runners to the concept of customer service. Rwanda has a lot to offer the world, especially when it comes to tourism and hospitality. Through our work with hotel owners, beverage distributors and restaurateurs, we saw that there was no culture of customer service in the country. We were not alone in recognizing how poor customer service would hold Rwanda back. 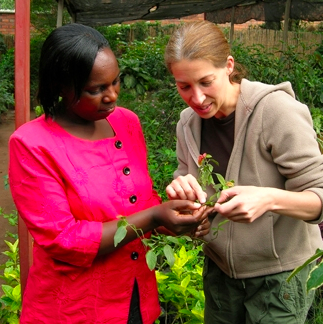 Kate Buggeln fell in love with Rwanda and had encouraged her husband, Steve Kulovits, to join Bpeace. He quickly became the Rwanda customer service guru across all industries and penned one of our early Growth Guides. In 2008, BAM (Bpeace Action Marketing) was a pop-up team of five Bpeace skilled marketing volunteers (Kate, Athena Katsaros, Marie Greener, Cass Greener and me) who traveled to Rwanda to create brand identities--including marketing plans, brochures and signage--for seven Fast Runners. While we were in the field for two weeks, back in the states, eight graphic designers worked night after night to create the materials the Bpeacers in Rwanda requested. Digital was not yet prevalent, and over the next year the Fast Runners were slow to implement our work because printing costs in Rwanda were so high, as they remain to this day. Donna surrounded by her ice cream customer service trainees. Blue Marble Ice Cream in Brooklyn had a dream, and Sweet Dreams became their Butare, Rwanda, outpost to train women from a drumming troupe to produce and operate the country's first ice cream shop. Blue Marble reached out to Bpeace to provide business training to the women, and Sabra, Donna Fleetwood and Fran Pastore traveled to Butare to tackle finance and customer service training. Fran even pulled in the local Rwandan bank manager to help the women set up personal accounts for their first paychecks. Blue Marble's vision is the focus of the award-winning documentary Sweet Dreams. Filmmaker Leah Warshawski, of Inflatable Film, had spent several years in Rwanda working on her award-winning documentary Finding Hillywood (released just last year) and saw the potential of creating jobs in the country's growing film economy. She reached out to the Academy of Motion Picture Arts and Sciences, and Bpeace, and together we created RwandaFilm.org, an online marketplace to connect Rwandan filmmakers and crew with international journalists and filmmakers. The Bpeace development team included actor and playwright Jay O. Sanders who, when he is not working on TV shows like Person of Interest, promotes his three-hour play about the Rwanda genocide, Unexplored Interior. Later in 2014, we hope to turn over RwandaFilm.org to a Rwandan organization to further manage its growth. We have a budding relationship with the African Entrepreneur Collective, a U.S.-based nonprofit that provides some of the same services that Bpeace does. We hope to take a few of their best entrepreneurs and graduate them into a Bpeace Fast Runner program--funding permitting. Stay tuned. It's been a long journey. Change is a process, not an event and sustainable change is meaningful transformation.